Bevboy's Blog. : Post 3105 - Coolest Radio Blog Post Ever! This blog post has been 35 years in the making. In the late summer of 1980, Richard Sanders, who played Les Nessman on WKRP in Cincinatti, visited Halifax for some reason, and was interviewed on the old CJCH Hotline. If my memory serves, this would still have been the time when Dave Wright was the full-time host of the program. Steve Murphy gradually took over the program starting in 1981, once again if memory services. But I digress. 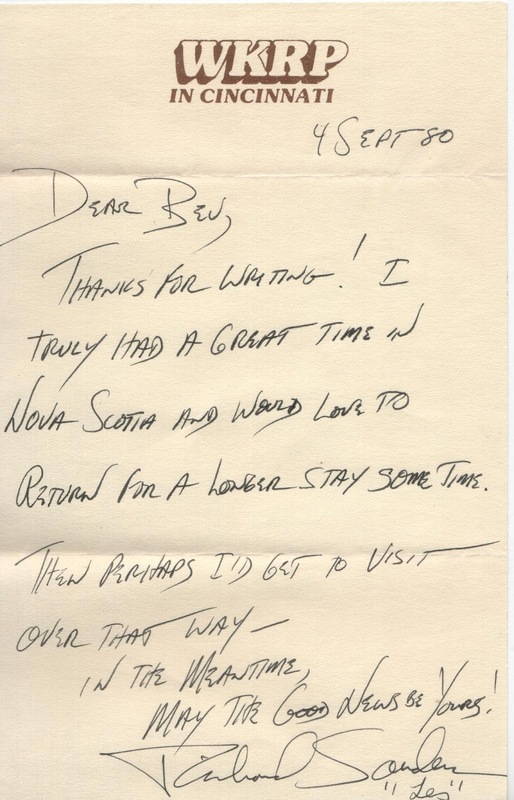 I do not recall much of the interview, but at the very end, Dave Wright mentioned that Sanders loved getting fan mail and gave out his mailing address. I dove for a pen and pencil and jotted down the address. You have to realize, I loved WKRP. It went on the air in 1978, and I was a fan from the first episode. I watched it nearly every week, including repeats, until it went off the air in 1982. The 1992 revival show was syndicated and hard to find, in those pre-dvr days. Anyway, where was I? I wrote some kind of letter to Richard Sanders, popped it in the mail, and forgot about. Oh, my God! Was it? Could it be? It was! A letter from Richard Sanders addressed to me. But that wasn't all!! There was the enclosed photo. My goodness, my little 16 year old heart went aflutter. 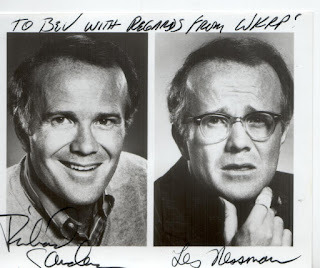 I adored the show, and Les Nessman was my hero, a middle-aged version of me had I had the guts to go into radio and be stuck reading the sports reports for sports I didn't care about. Some of the funniest moments of WKRP were all about Les, and Sanders' approach to the character. There was the time he went out on a date with Jennifer, played by bombshell Loni Anderson. As he got dressed, putting on his hairpiece, Foreigner's "Hot Blooded" was playing in the background. Then there was the time when Nessman messed up the pronunciation of famed golfer Chi-Chi Rodríguez. He struggled with it, and came up with "Chy Chy Rod Ra Gweeze". And let us not forget how Nessman crowed about winning the Silver Sow Award for his farm reporting. Dr. Johnny Fever always called it the Purple Pig Award, much to Nessman's dismay. I kept this letter for years, but lost track of it quite a few years ago. Every once in a while I would find a stash of old letters and tear through them in the vain hope that the WKRP letter would be there, but it never was. Finally, a few hours ago, I was stuffing old magazines and stuff into a plastic bag, to go out with Tuesday's recycling. I looked on the floor, and there it was. Yes, the room is a mess, but I am working on it. I have put the letter in a safe place, which means I will soon misplace it again for another 20 years or so. But at least this time I have scans of the material for you and me to enjoy. And, who knows, maybe 75 year old Richard Sanders will see this and smile. Or contact his lawyer to issue a cease and desist letter against me. Wouldn't be the first time. I love this old stuff! Thank you, sir. And... who are you? Do I know you? Never mind. I see that this is Sheldon MacLeod. Glad you liked the blog post, sir, and that you took the time to read my humble post. All my best, as always. 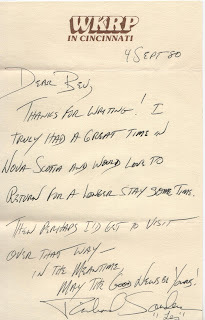 Very cool letter! I love WKRP too. In fact, in the early 200s I worked at a radio station that missed out on the call letters WKRP when they became available... by less than 5 minutes. We ended up goin with WKRI. Not nearly as cool!! Rock on!